We started hiking from our parking place at the northern end of Beaver Reservoir at 7:32. This is the trailhead of the Coney Creek 4WD Road. 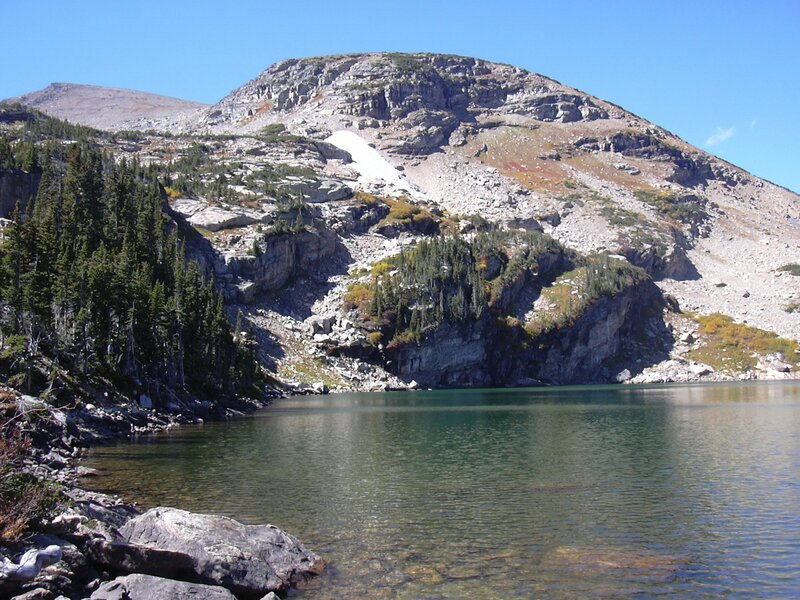 From here the National Forest Service says the distance to the Coney Flats Trailhead, which is also the Indian Peaks Wilderness boundary, is 3.4 miles. Our GPS odometer showed 3.08 miles when we got there at 8:40. The GPS always shows less than actual because it uses a connect-the-dots algorithm in calculating distance so that not-so-straight paths are shortened to straight lines. The sign at the Coney Flats Trailhead (Indian Peaks Wilderness boundary) says it's 3 miles to Buchanan Pass. We got to Buchanan Pass at 10:10. As we got to the pass, a strong cool wind hit us, and instantly made us cold, due to all the sweating we had been doing on the ascent. We quickly put on jackets and headed north on the divide toward Red Deer Mountain. Most people, when they get to Buchanan Pass (11837 ft), head south to Sawtooth Mountain at 12304 feet. Few people climb the mountain to the north, Red Deer Mountain at 12391 feet, even though it's higher. I suppose that's because Sawtooth is a dramatic looking mountain with its sheer south face that can be seen far and wide. We reached the summit of Red Deer Mountain at 10:30, with the odometer showing 6.77 miles. The summit is rounded and wide. It's marked by a wind shelter, and a couple of summit registers. To the north you can see Ogalalla Peak and Elk Tooth, Copeland Mountain, and Longs Peak. Saint Vrain Mountain can be seen to the northeast, and Sawtooth Mountain to the south. One of the summit registers was placed there by the Colorado Mountain Club, and it calls this mountain Bill Weber Peak. Someone scratched out that name and said its Buchanan Peak, while someone else said it's Red Deer Mountain. The other register, in an old jar, claims the peak's name is Spotted Pony. I'm going with the name "Red Deer Mountain" since Gerry Roach calls it that, and if anyone knows the names of peaks it's him. Due to the high wind on the Red Deer Mountain summit, we soon left the summit and headed northeast toward Red Deer Lake. Note that there is no official trail from the summit of Red Deer Mountain to Red Deer Lake, and you've got to be careful to avoid cliff faces. We headed northeast to a tiny unnamed lake at about 10860 feet (position: 40.1404/105.6149). This tiny lake was quite nice, surrounded by autumn colored golden grasses. Descending from the tiny lake, we suddenly came upon a beautiful overlook to Red Deer Lake. We reached Red Deer Lake at 12:35, where we had lunch near the shore, while enjoying an incredible view of the lake and the slopes above decked out in autumn colors. The lunch spot at Red Deer Lake was so nice, we stayed for nearly an hour, before leaving the lake at 13:20, and began following the Red Deer Lake Trail back. At the lake, the odometer showed 9.1 miles. After hiking about 0.3 miles, we turned right off the trail and went southeast through trackless forest for about 0.2 miles until we came upon the Buchanan Pass Trail. We turned right on the Buchanan Pass Trail and hiked for about 1/2 mile to the intersection of the Buchanan Pass Trail and the Beaver Creek Trail, getting there at 13:53 where the odometer showed 10.1 miles. Turning left onto the Beaver Creek Trail, we headed to Coney Flats, getting to the Coney Flats Trailhead at 14:32. We returned to the parking place at 15:59, where the odometer showed 14.9 miles. The total trip time for this hike was 8 hours and 27 minutes, and the elevation difference from lowest to highest point was 3,210 feet.